Justin Bieber’s concert is over and the hullabaloo are still fresh and serving hot on social media. India’s most biggest and highly anticipated Justin Bieber concert was an disaster after public and Bollywood had their own complaints. And then we got our eye on the series of tweets from singer Sona Mohaptra. 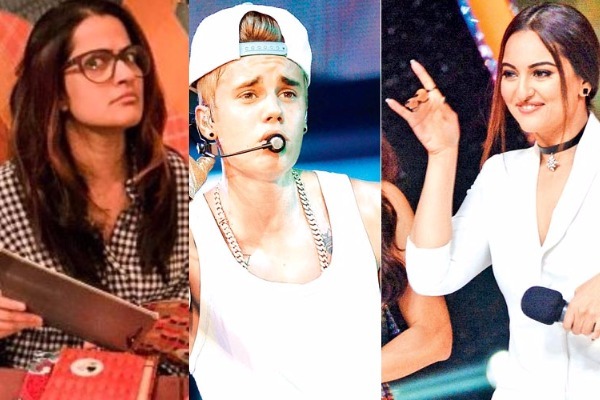 She took a dig at Justin Bieber and indirectly at Sonakshi Sinha. If you are unaware of the past controversy, know that Sonakshi Sinha blocked Sona Mohapatra from her twitter account because the later had slammed the actor for performing at justin’s concert. The ugly fight started with a spark of singer Kailash Kher’s tweet and caught fire when musician Armaan Mailk, Ammal Mailk, Sonakshi and Sonakshi’s brother Luv Sinha too got involved. The singers objected the trend of actors taking over the singing stage that too at the international stage level. But that was not yet over for Sona Mohapatra. Why would she, if see the golden opportunity to take down someone. She once again stepped into the twitter rant and this time she trashed Canadian pop singer Justin Bieber along with Sonakshi Sinha. Dear trolls/Beleibers, I am sorry your idol let you down & didn't bother putting up an honest show. I had nothing to do with that. Peace ✌? How come we don't hold our idols to standards? Forget higher, just a small standard of- don't take our ? & then treat us with such contempt? Meanwhile my Facebook timeline also has enough wannabes flaunting their night of glory. Grateful to have attended a fake, overhyped gig.? The PR & marketing machinery spitting out realms about how the lip-syncing Bieber spent time with underprivileged kids before the gig. ? We don’t know if Justin Bieber would react to Sona’s verdict, but we surely want to know what is Sonakshi’s counteraction for Sona’s harsh words. Also Read: Tweeple Called Sonakshi Sinha as Reena Roy, After Shatrughan Sinha Mistakenly Wished Kader Khan With Big B’s Pic! Previous : Sonali Bendre Calls Bieber’s Concert Waste Of Time, Arjun Rampal Too Angrily Walks Out. WHY? Next : Shahid Kapoor’s Daughter Misha To Make Her TV Screen Debut With Mommy Mira?